Cynthia Kadohata’s ode to the breadbasket of America has received six starred reviews and was selected as a National Book Award Finalist. (Atheneum; ISBN 9781416918820; June 2013; Summer Catalog). It seems that if Summer’s Japanese American family didn’t have bad luck, they’d have no luck at all. Certainly good luck (kouun) is elusive. Consider that Summer has had malaria; her little brother, Jaz, is friendless; her parents have to fly to Japan to take care of elderly relatives; and her grandmother (Obaachan) and grandfather (Jii-chan) must pay the mortgage by coming out of retirement to work for a custom harvesting company. When the siblings accompany their grandparents on the harvest, Summer helps her grandmother, a cook, while Jaz is Jaz: intense, focused, and bad-tempered. At first, things go reasonably well, but then Jii-chan becomes sick, and it appears that it might be up to Summer to save the day. Will she succeed? Kadohata has written a gentle family story that is unusual in its focus on the mechanics of wheat harvesting. Readers may skim the more arcane aspects of the labor-intensive work, focusing instead on the emotionally rich and often humorous dynamics of Summer’s relationship with her old-fashioned but endearing grandparents and her troubled younger brother. 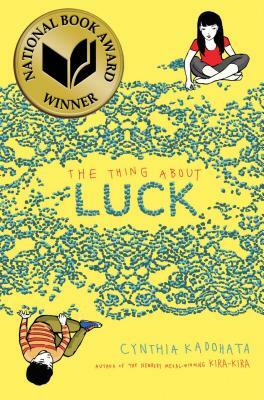 Another engaging novel from the Newbery Medal–winning Kadohata. HIGH-DEMAND BACKSTORY: With the blogosphere already starting to buzz, and author appearances and web promotions planned, Kadohata’s already sizable audience will likely increase with this title. "Twelve-year-old Summer and her Japanese-American family work every harvest season to earn money to pay their mortgage. But this year, they face unprecedented physical and emotional challenges. *KADOHATA, Cynthia. The Thing About Luck. illus. by Julia Kuo. 288p. S & S/Atheneum. June 2013. Tr $16.99. ISBN 978-1-4169-1882-0; ebook $9.99. ISBN 978-1-4424-7467-3. LC 2012021287.